I have belatedly been reading More Lives Than One by Gerard Hanberry from the Collins Press. It tells the fascinating story of Oscar Wilde, his ancestors and descendants, and the massive contradictions at the heart of the family. It is also an intriguing mapping of the Wilde west of Ireland lineage from Castlerea, Co Roscommon, through the Ballymagibbon estate at Cong, to Moytura House at Lough Corrib. Oscar Wilde wrote in De Profundis: ‘When first I was put into prison some people advised me to try to forget who I was. It was ruinous advice. It is only by realising what I am that I found comfort of any kind.’ More Lives Than One deepens our insight into who and what Oscar Wilde was by situating his story in the context of an intriguing family history. I have been absent from this blog while getting the book over the finish line. 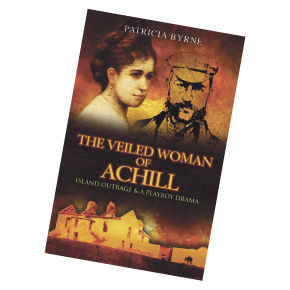 The Veiled Woman of Achill will be published by the Collins Press in April. There will be a launch in my home city of Limerick in late April and a launch / reading at the Valley House, Achill in early May.